Were you ever frustrated because you wanted to sound more natural and native like adding color and emotions to your speech but were stuck for means Here is your chance to remedy the situation for this book will help you master real idiomatic English. Each single headword incorporated in this dictionary offers a variety of synonymous metaphorical expressions, idioms, and phrasal verbs that you can choose from and use in your own utterances. You can leaf through this book just for fun to enjoy the awesome number of colorful alternatives to words or use the wealth of dictionary material in preparation of a particular assignment. While targeting primarily ESLEFL students worldwide the dictionary provides ample resource for teachers, making it possible to introduce or practice lexical units in tandem with their phraseological counterparts, familiarizing students with the richness and diversity of alternative means of expression. 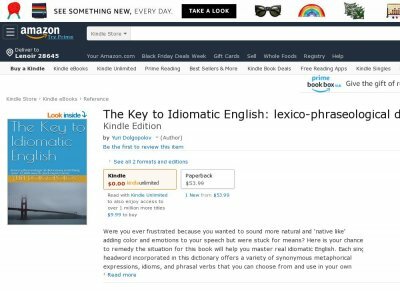 The book, may also be of interest to native speakers and linguists exploring the phenomenon of lexico-phraseological synonymy. The appended Word Index allows a quick overview of all headwords incorporated in the dictionary. Executed in the three-color scheme the book offers a clear and user-friendly display of all material treated in the dictionary.